Please see the disclaimer and our store policy below the shopping cart before ordering. Our wild carrot seed products are harvested by hand in the fields and forests surrounding our area. We do not harvest these by mechanical harvesting equipment and we use human hands to clean our seeds. That being said, if you notice any insects at all in your seeds order, please don't panic and think that our product is "unsanitary" or unsafe. It is completely safe and as sanitary as wild harvested non-timber products can allow. We do not wash these seeds, nor would that do anything except promote the spread of mold in your product. Most of the products that you buy in a grocery store contains insects or parts of insects. Since this is all cleaned twice by human hands, it is still possible to miss a few bugs or their debris or other tiny objects. If you see any, simply remove them from your seeds before you chew them. You may also find flower brackets but we try to remove as much debris as feasibly possible. FDA regulations concerning food and food supplements including herbs allow for certain insects and/or their parts or some foreign things in your food and it's completely safe to consume. Especially insects when consumed within food. All of the food products that you consume on a daily basis has insects, their parts and some foreign materials in it. We do not commercially grow any of our products that we harvest in the wilds nor do we have any control over how non-timber forest products are grown there, which includes the wild carrot seeds that we harvest. We do not use any chemicals here at our facility to process any orders. Please read Federal regulations on their website for clarification. Click the following link to go to their regulations. Copy and paste this link in your web browser for details of what the FDA allows in our food. You will be shocked. We will be making adjustments to our shopping cart system. If you find that cart is not working, and if you want to order any of the products please email us and will take care of your order until the cart is updated. Do not use the shopping cart if you live outside the U.S. We can send you an invoice via email that will cover the order plus shipping costs. Due to Agricultural Restrictions we cannot ship whole seeds to Michigan, Ohio, or Washington state. We can ship ground up seeds that are not viable if planted. Do not use the shopping cart if you live outside the U.S. We can send you an invoice via email that will cover the order plus shipping costs. Email us for details please. Serving size is 3-6 dropper fulls as needed for an average adult female (human). It is advised to use this along with any of the seed products. For an average size cat it would be 6 to 10 drops (not dropper full) per female cat. An average size cat can weigh 7.9 – 9.9 lbs. according to one source online. 50 drops = 1/2 tsp. 25 drops = 1/4 tsp. A 1 ounce bottle of contains approximately 1080 drops and a 4 ounce bottle contains approximately 4,320 drops. Please email us for ordering information if you want an international delivery. The shopping cart below is not set up for all international orders. Serving size is 3-6 dropper fulls as needed. It is advised to use this along with any of the seed products. 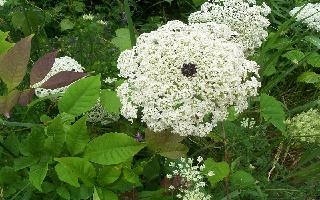 Bulk orders are available for wild carrot seeds. You have to order two or more pounds to get special pricing. Please email for information. The seeds come from flowers that had the dot in the middle. Each plant is tagged when in bloom to differentiate those from the regular flowers. It takes much time to tag each individual plant as both plants can grow side by side. Then, when the seeds are mature, they are harvested and kept separate from the regular seeds. They are more expensive, but great care and effort is done to ensure you get what you pay for. There has been no "scientific" research to tell whether the seeds from flowers with the dot are more potent. It is based on the feelings of some that they are. These seeds are listed only for those who feel that they have more potency. There will be sales tax added to all purchases within the U.S. Shipping rates have increased when shipping via U.S.P.S. Due to recent regulations concerning natural herbal alternatives we are re-wording our entire website to comply with Federal regulations. If you have questions about any of our products we can answer most of your questions via email. We cannot advise anything about health related questions, what herb to use for what, dosage amounts, nor give you any advice about using herbs. The ethno botanical plant products we sell are sold as a "novelty" to be used for research, spiritual reasons, education, or whatever reason you decide to use them. None of these plants are sold or intended for human consumption. None of our products have been approved by the FDA so we have to have you read these disclaimers before you purchase them. Wild Pantry will not be responsible for any consequences if you decide to ingest or use any of these products for human consumption. You do so at your own risk. We have to say this in order to comply with Federal regulations. IF YOU HAVE ANY QUESTIONS ABOUT THE USE OF HERBAL SUPPLEMENTS, PLEASE DO A GOOGLE SEARCH AND DO YOUR OWN RESEARCH. We will list some informative links further down the page. Please read our disclaimer before ordering. Once shipped, none of the products on this page are returnable for refunds due to the possibility of product contamination and/or tampering. The products are intended for human consumption and we cannot restock returned merchandise. There are NO exceptions. Please be aware that once you order and receive your product, it is not returnable to us. Please be sure that you put the correct shipping address on your order as we are not responsible for items shipped to the wrong address. Shipping costs will be added to your order. Shipping price is calculated on your purchase cost and not by weight. We use USPS Priority boxes that have delivery confirmation tracking numbers. If you want your purchase shipped another way do not use shopping cart and email us your preferences. We will try to accommodate your request. Orders received on holidays, Fridays or weekends will be processed within three or four business working days after the holiday. Most orders are shipped within 3 business days of receipt of order. Deliver times vary from 2 to 5 days depending on where you live. Orders shipped to the mid-west and west coast can take 5 days on delivery. Wild Pantry does not sell medical remedies nor can we legally advise you about any health issues or the herbs used for certain health problems nor can we advise dosage requirements. legally give anyone medical advice on any of our supplements or products. If you have specific questions about any of our products you can email us and we can answer basic questions about serving sizes or product details. We highly recommend doing a Google search on any information you need regarding any of our herbs or products. The herbs and other products that we sell have been used in the past for certain health issues or as food. Are all of our products organic? No, we cannot guarantee that ALL of our products are organic but most our products are ethically wild harvested from the private lands of southeast Tennessee or North Carolina. Some of our medicinal herbs are organic and are marked accordingly. Disclaimer: Although there has been research done on herbal contraceptives in India and other foreign countries, there has been very little research done in the U.S. The use of herbal contraceptives are done so at your own risk. Abstinence is the only 100% way to avoid an unwanted pregnancy. Please read all disclaimers before ordering any of our wild carrot products. Wild Pantry does not guarantee that any of these products will keep you pregnancy free. We carry many wild carrot products for convenience those who have requested specific types of QAL products. Click here to read Disclaimer/policy.